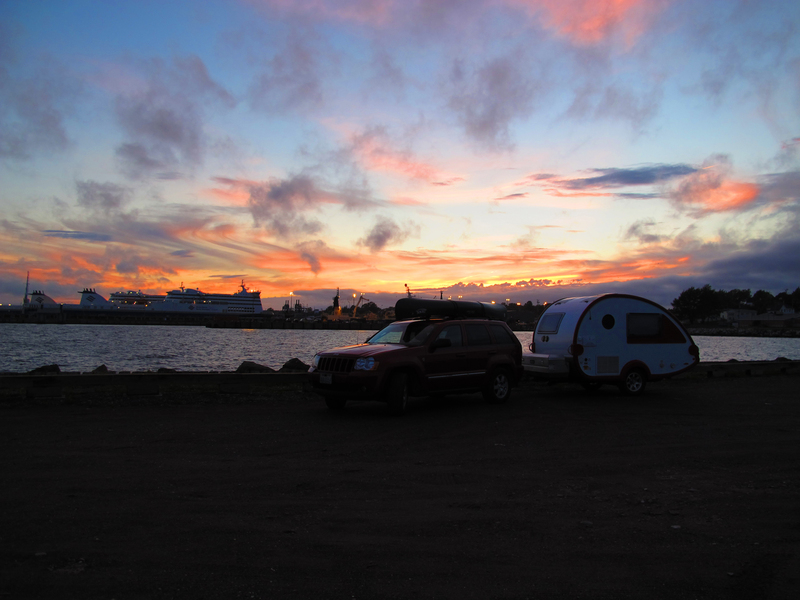 September 20th & 28th, 2015 – Nova Scotia to Newfoundland Ferry – I finally had convinced myself that I should take the ferry to Newfoundland. Good thing as Newfoundland was a highlight to me akin to northern Alaska. And, the word ferry describes the purpose, but probably doesn’t conjure up the picture of these huge ships. The ferry to Newfoundland, leaves from northern Nova Scotia and is about a six hour crossing in good weather, but it is a full day event. 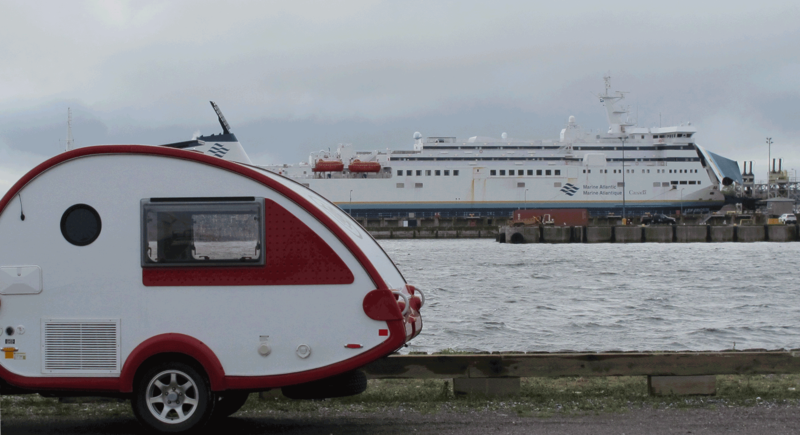 The ships are big, with almost two lane miles of car and truck capacity (1.76), a restaurant, bar, and snack bar, recliners and cabins. There is one day run, and one night run in each direction, each day. On the day run you can see and do more, but arrive with daylight mostly spent. On the night run everyone sleeps and you land bright and early with a day ahead of you, if you didn’t sleep your schedule is now really messed up. I chose to take the night run over, and the day run back. Making a reservation is easy with both online and phone options. My experience was after peak season and I found availability as little as a day or two in advance, I gather you want to plan a lot more in advance for peak season. 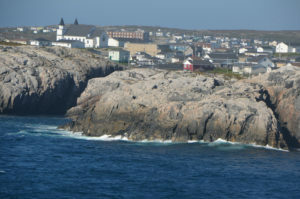 The crossing from North Sydney, Nova Scotia to Port aux Basques, Newfoundland takes six to eight hours. 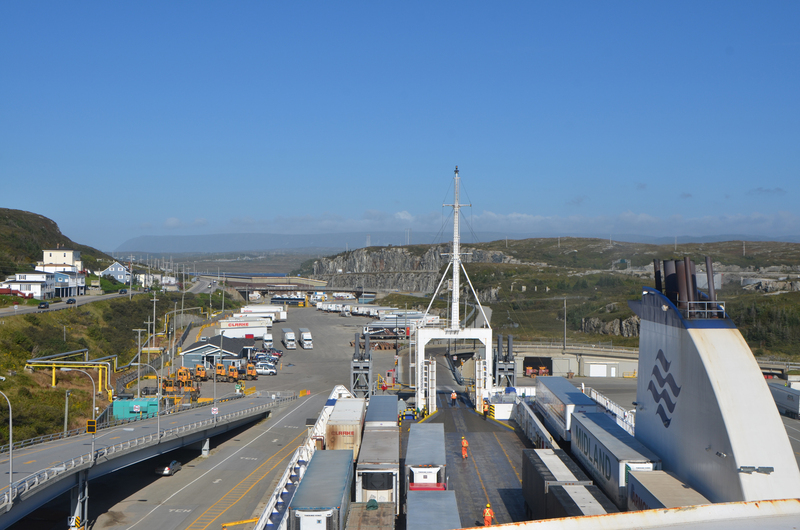 During the peak season they also run ships to Argentia, Newfoundland that is more like 16 hours. 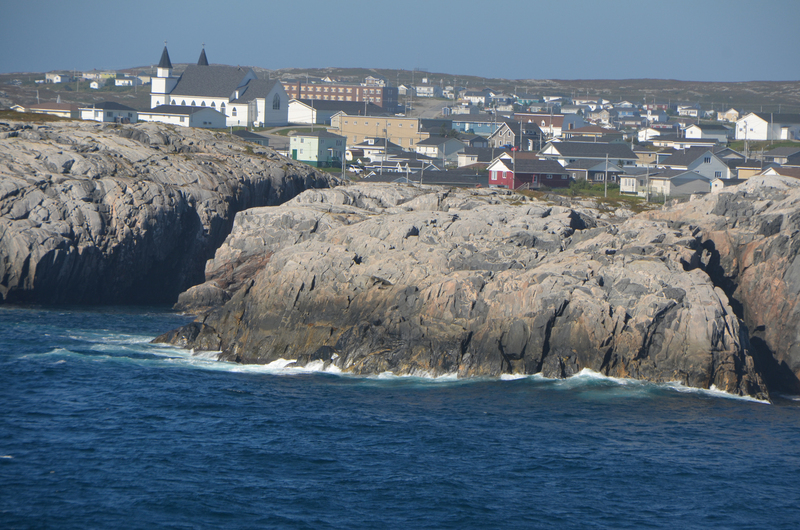 The difference is that the shorter route drops you at the southwest corner of the quite large island of Newfoundland. The longer route drops you near the eastern end of the island and the biggest city, St. John’s. The drive across the island one way is about 600 miles. You need to arrive about three hours before the sailing. Unloading can take a while too, so I found that the whole process of crossing took almost 12 hours. Thus, pretty much a whole day. On the way over I didn’t want to arrive in an unfamiliar place and try to find my way around in the dark pulling a trailer. So I opted to take the night run. Cabins are in more of a demand at night and hence more expensive. So I opted for a reserved recliner at a fraction of the cost. The recliner worked out pretty well, but bring a pillow and blanket. They keep the cabin a little cool and a small pillow for your neck/head would be the ticket. I ended up reading for a good part of the ride because I didn’t want to miss out on anything, but in the end there wasn’t much to miss out on. I retrospect I might have done the cabin after all. With respect to the rocking of the ship, let me say that our weather was pretty mild. We still had a short period each way where the swells were big enough to make walking around a little different. This is the open ocean closer to the Newfoundland side, but I’d say it lasted no more than about an hour of the whole trip. Then for about two other hours there was gentle rocking. The gentle rocking was very nice on the ride back when I was sleeping in a cabin. But as we started following the coast the ship was quite steady. So an hour when you needed sea legs, the rest was pretty smooth. I had breakfast in the restaurant when it opened a little more than an hour from our landing time. At this point there was a pretty good swell going and the ship was rocking pretty strongly. Nice that there’s a lip around the edge of the table, and I took to holding my plate and cup while eating. However, the rocking was the bane of some stacks of dishes in the kitchen though. Twice there was some crashing and clattering back there, and later some sweeping of broken ceramics. The ships take a lot of cars and trucks spread out over three decks, 1, 3, 5. There is a ramp that allows the uppermost deck to be loaded separately from the lower decks, and honestly I never saw the lowest deck get loaded because it was done before trailers were sent in. I was on the middle deck (3) both times. Lots of car/trailer combos and RV’s mixed in with the commercial trucks and a bus or two. In addition to commercial tractor/trailer rigs driving on, they also ferry over a lot of commercial trailers without the tractor. So there are several small utility tractors that are pretty constantly running back and forth pulling these trailers. It looked like turnaround time was about ten minutes for each unit, and when I was watching there were three tractors working, so probably a trailer every three minutes or so. They typically drag the trailers in, but near the end several of the trailers were backed up the curved ramp. Those of us waiting in the lot watched this activity with admiration. Elevators take you up to the rest of the ship, and once the ship is underway passengers aren’t allowed back to the car decks. The main deck for passengers is deck 7. Recliners, food, internet terminals, gift shop, reception is all here. There are cabins on decks 8 and 9, with reserved recliners on 9. Deck ten is the sun deck with views to the sides and aft. There is also outdoor deck access on level 7. You might want to take the stairs down for disembarking or stand in the line for an elevator. I found that the elevators started at deck 9 when empty, so being up there we seemed to have less of a line problem. On the ride back I wanted to see both ports during the day, and go outside and look at the water too. So I took the day run. I got a cabin, and am glad I did. I had been up with the eclipse the night before, and a little nap was very pleasant. It also meant that I could bolt out of camp early and take a shower in the very nice cabin rather than slightly more rustic (although still very nice) campground. A word of caution to those going over about soil and plants. There is information that tells you these things aren’t allowed. On the way over there’s no question or process to check this. But on the way back they will want to ask and inspect, and if you’ve been off road a lot (and didn’t wash it yourself), they may want to wash the car too. I didn’t think much of it, but one of the people I talked to told of a friend who had brought a plant over from Nova Scotia and couldn’t bring it back. While I was waiting in the line going back I decided to put the GoPro camera on the front of the Jeep. It took some adjustment to get it level, and this drew the attention of some folks on a tour bus. This of course started a bit of conversation and another opportunity to let people know about the blog. We will see about this footage getting into a video eventually. While on the ship I also met several other folks whom I had met recently at other campgrounds along the way. I have to say this trip would have been very different if I had made any other choice. 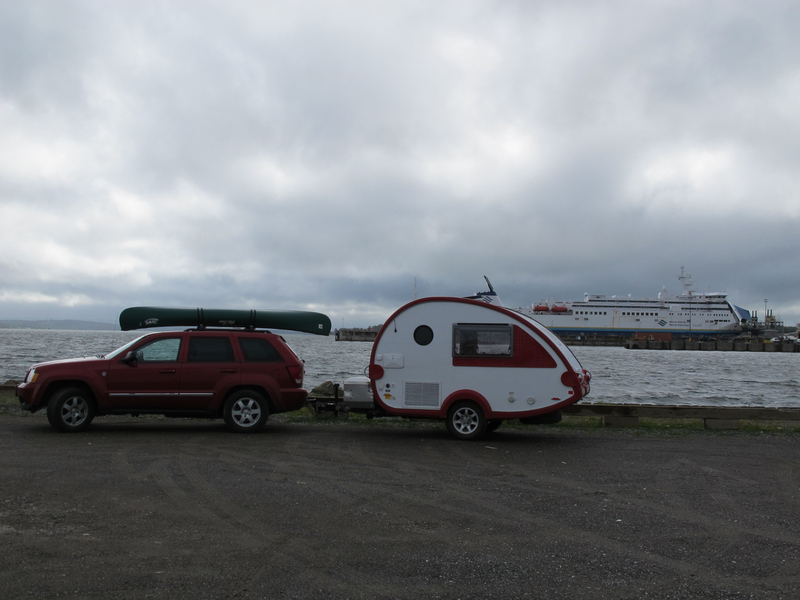 I found a nearby park with a view of the ferry dock. I whiled away the time in the trailer, reading and found a little WiFi for research. Sun sets behind the docks. They put me in the wrong line to start with. So I impressed everyone by backing the trailer from the front of the line back to well behind where I am here, then into this line. After getting parked there was time to wander into the terminal. My rig is third from the back in the line of odd sized vehicles. All of those trailers without tractors will be loaded by utility tractors before we head out. Trucks entering the upper deck via the ramp. Into the front of the ship. Neatly parked. Don’t think for a moment that these empty lanes will go unused. Front right seat is my “reserved recliner”, no one in any of the other three on this trip. The beauty of off season travel. My reflection in the window above. 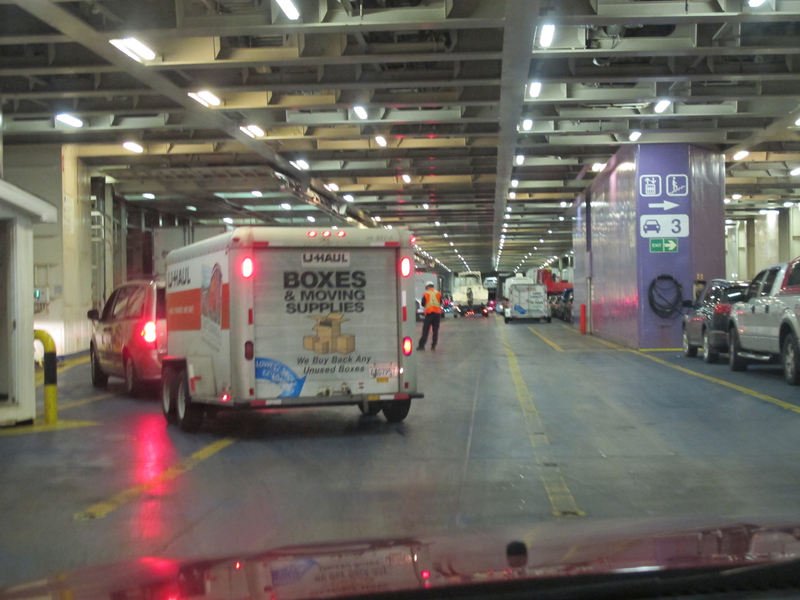 Note the bright lights on the deck below and all the trailers lined up. 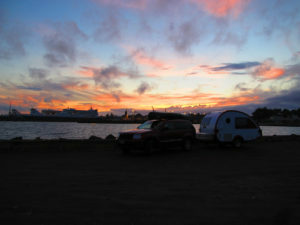 Next morning in Port aux Basques. Returning to the vehicle, as you can see they filled the space. 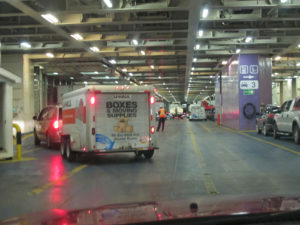 On the deck on my way back to Nova Scotia, looking at the staging area. Rear upper deck is exposed, you can see the ramp leading to it. My cabin for the ride back. Nice bathroom with a shower. These houses may not be far up from the water, but at least they are built on rock. Not sure what this building is, but looking online it appears there is a helipad behind it. No direct road, so anything on this little island must have been ferried here. UPDATE, the good folks from the Town of Channel-Port aux Basques tell me this is the lighthouse, but with a casing around it while they did some repairs. A sister ferry headed the other direction on this run.